THE RIDER is Chinese director Chloé Zhao’s sophomore feature after her 2015 Palme d’Or-nominated SONGS MY BROTHERS TAUGHT ME. 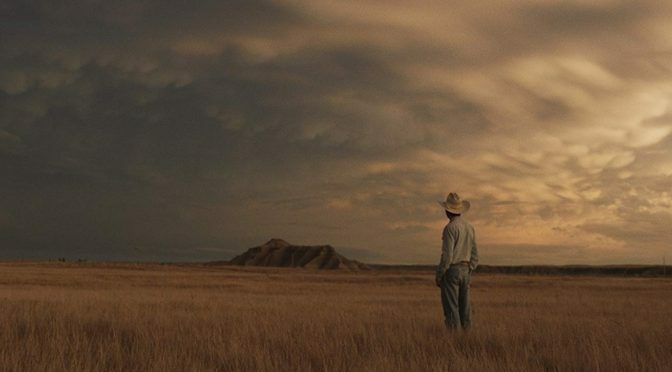 Filled with beauty and melancholia, THE RIDER is a contemporary western offering a fly-on-the-wall look at poverty and disability in America’s rural heartland. Brady Blackburn (Brady Jandreau) is recovering from brain damage after an accident riding a bucking bronco. His budding career in the South Dakota rodeo circuit hindered, Brady struggles to contemplate an alternative future to provide for his poor family. Surrounded by overtly masculine stereotypes of the American West, the film explores Brady’s attempt to define what makes him a man when faced with disability. Nominated for best picture at the 2017 Independent Spirit Awards, Zhao’s film is a superb achievement in portraying the ideals of the Old West in contemporary society. The male archetype of the strong, stoic cowboy is explored to great effect as Brady undergoes a silent struggle to remain relevant in the world he fears he is losing. Jandreau gives a strong performance, working from a script based on his own experiences. Accompanied by his family and friends playing fictional versions of themselves, the film attains a level of authenticity often missing in Hollywood depictions of real-world hardship. Zhao evokes genuine emotion from untrained actors and allows their own backgrounds to influence the characters. Brady is very much caught between a sense of freedom and confinement. The persistent danger of rodeo life gives him a rush like no other; the wildness of the animals representing a past where men knew how to make their way in life with an all-or-nothing attitude. Brady’s injuries mean he must find a way to evolve. Riding is all he has ever known; his father was a rider and his friends all live for the rodeo. Possessing very limited skills, he takes a menial job in the local supermarket to make ends meet. The aisles are sterile and harshly lit; Brady walled-in by mundane products. Even at home he is not at ease. Cold blue lighting emphasises his depressed state while closeups focus on his body as he flexes his muscles and tries to adjust to the cramped space he finds himself in. Similar to a horse locked in its stable, Brady yearns to be back out on the vast open planes. Walking across the Dakota fields and gazing up at the warm glow of the setting sun, one instantly relates to Brady’s plight. Every landscape shot demonstrates Brady’s conflicting emotions; beauty is juxtaposed by the banality of urban life. Every landscape shot demonstrates Brady’s conflicting emotions; beauty is juxtaposed by the banality of urban life. One of the film’s best scenes features Brady taming a horse. Circling one another in an enclosure, he tentatively touches the horse and slowly gains its trust. The direction is unobtrusive, simply allowing Jandreau to do what he knows best while the viewer witnesses a real connection forming between man and animal. These are two confined creatures learning to adapt in the world, and their mutual understanding effectively demonstrates why Brady is so reluctant to give up riding. The scene is leisurely in pace yet tense, knowing how dangerous the occupation can be. The pair receives a tender moment of happiness, albeit short-lived as Brady must confront his future. Brady suffers a very public identity crisis. Beyond his own ambitions, everyone he knows expects him to continue riding. When greeting fans in the supermarket, he lies about his job being merely a hobby to keep himself busy. He visits his severely disabled friend Lane Scott in rehab and assures others that Lane will ride again, even though this is obviously impossible. Brady projects his own hopes onto Lane, refusing to admit his career is over. Prone to seizures and endangering himself if he continues to ride, Brady searches for meaning in a life beyond the saddle. His autistic sister Lilly presents an innocent view of the world, revelling in its beauty and wonder despite her impairment. Brady clearly admires her naivety and wishes he could turn a blind eye to his problems. Torn between selfish desire and responsibility, he must decide the value of his own life. Understated and compelling, THE RIDER is an alluring film that presents a thought-provoking approach to universal issues of obligation versus fantasy. Our thanks to the Dundee Contemporary Arts for providing Murray’s ticket to review THE RIDER.